This astonishingly misleading statement about polar bear numbers has little resemblance to the conclusions of the study that produced the most recent counts (Lunn et al. 2013). Figure 8 from this report, copied below, shows the real story. Figure 8 from Lunn et al. 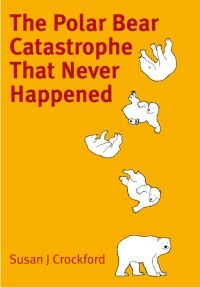 (2013) report on W. Hudson Bay polar bear population. 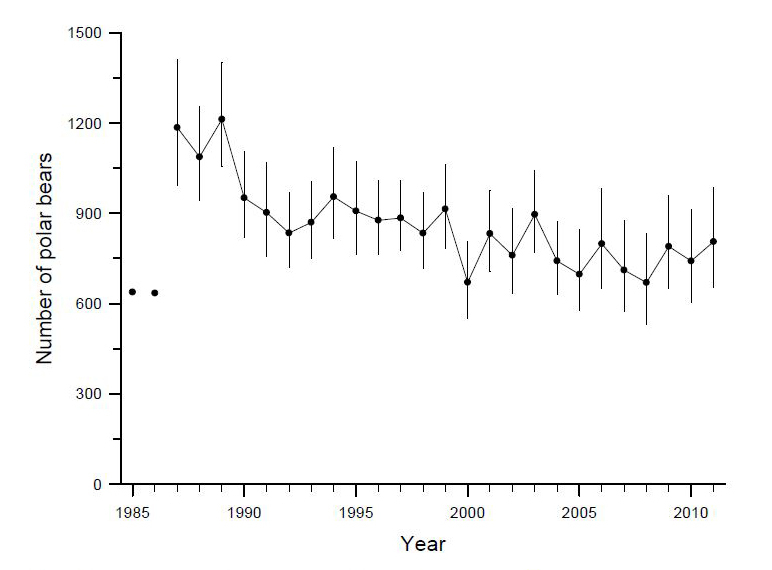 First of all, it is apparent from the graph above that the most noticeable drop in polar bear numbers in Western Hudson Bay occurred back in 1990, which had the second-earliest breakup date since 1979. See Fig. 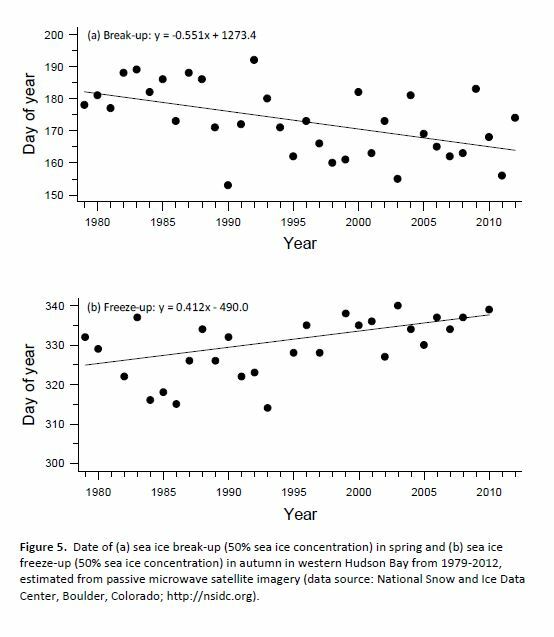 5 from the report copied below for breakup and freeze-up date changes over time, which oddly uses the old criteria for defining breakup and freeze-up, not the new method said to best describe conditions relevant to polar bears. What is almost more striking than the slight trend for each, is the year-to-year variability. They instead calculated a new estimate for 2004 using the same method they used for 2011 and came up with these figures: 2004 – 742 (range 630-872) and 2011 – 806 (653-984). The two estimates are not statistically different, indicating no change (and definitely no decline) since the last estimate was calculated a decade ago. That’s certainly not the impression anyone would get from the “Report Card” statement quoted above. The trend of the Western Hudson Bay polar bear population is now considered ‘likely stable’ by Environment Canada, although the IUCN Polar Bear Specialist Group insists on keeping its assessment of “declining.” Go figure. The only way the mark-recapture study referred to in the above statement (Bromaghin et al. 2014, in press) got the results it did was because the authors failed to include the last two years of available data – they truncated the study at 2010, while data collection continued until 2013. It’s a real work of obfuscation and it’s not surprising to see it given prominence in this report. The only new data these authors collected came from 2007 through 2010 (details here), which were added to numbers from previous studies. The authors knew before starting their field work in 2007 that a population decline had taken place just before (2004-2006). They also knew why the numbers had dropped and that previous declines (caused by similar conditions) had been followed by a full recovery. The decline in population was caused by thick spring ice in spring, a recurring phenomenon unique to this region that has always, as far as is known, been followed by a full recovery in population numbers. The authors looked for it, but found no correlation between the population decline with reduced summer sea ice. The authors of this study appear to have deliberately excluded two years of available data in order to create an anomalously low population estimate and an exaggerated declining trend. This conclusion is supported by a preliminary report published by the US Fish and Wildlife Service in their 2013/2014 Polar Bear Newsletter that their fall aerial survey results showed that by 2012, the population was high compared to previous years. In other words, the population recovered from its earlier decline, a fact which the authors of the paper had to have known. These statements about the Chukchi Sea population gloss right over the fact that PBSG biologists predicted that Chukchi Sea bears would be as severely impacted by the recent loss of summer sea ice as Southern Beaufort bears. However, once researchers got around to doing a comprehensive study, they found Chukchi polar bears were doing very well indeed, fatness-wise (only Foxe Basin bears were in better condition) and were reproducing well (some triplet litters were captured). Polar bear researchers most assuredly did not expect this result: the two regions are within the same “ecoregions” they defined for their computer models developed to predict the future – they expected variation in responses of polar bears to occur between different ecoregions, not within the same ones. In reality, the Rode et al. Chukchi Sea study presents strong evidence that the biologists’ predictions of a grim future for polar bears – based on theoretical responses to summer sea ice declines that have already occurred – have been refuted. Oh dear. Vongraven and York are really grasping at straws with this one and appear not to have read the literature they cite. One of the most publicized hybridization events documented by genetic studies (Cahill et al. 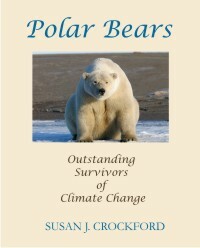 2013, which Vongraven and York cite) is about brown bears in Southeast Alaska meeting polar bears driven out of the Arctic by the Last Ice Age – in other words, a meeting of bears caused by extremely cold Arctic conditions, not warm ones. Recent hybridization events between polar bears and tundra grizzlies in the Western Arctic are due to male grizzlies traveling over spring sea ice into polar bear territory – a phenomenon noted as far back as 1885 that occurs when sea ice is at its maximum extent, not when sea ice is low. In fact, polar bear biologist Ian Stirling is on record as saying that hybridization is “definitely not” a sign of climate change. A graph from the “Sea Ice” chapter of the “Arctic Report Card” (Figure 4.2, copied below) says all you really need to know about changes in polar bear sea ice habitat over the last several decades. IUCN Polar Bear Specialist Group members (and others) focus on the red line — the dramatic decline in summer (September) sea ice. Sea Ice Figure 4.2 from NOAA’s “Arctic Report Card 2014.” The black line is the one that matters to polar bears. However, it’s the black line — the very slight decline in spring (March) sea ice — that’s important to polar bears. Spring is their critical feeding period; spring is when the presence of sea ice is crucial to polar bears and spring conditions have changed very little since 1978. Whatever happens to the sea ice from August to October matters very little to polar bears if they have fed well during the previous spring: their fat reserves will carry them through until the ice reforms in the fall. 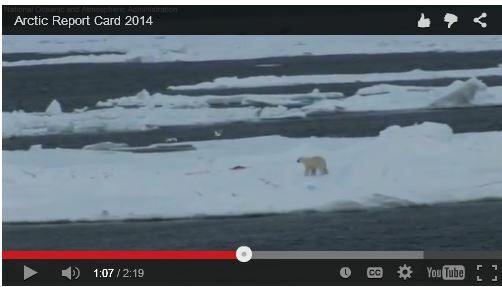 The red line above is a red herring — don’t be fooled, the black line is the one that matters to polar bears. 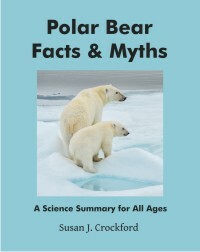 This entry was posted in Population, Sea ice habitat, Summary and tagged Arctic, Arctic Report Card, breakup, Bromaghin, cherry-picking, freeze-up, Geoff York, hybridization, IUCN Polar Bear Specialist Group, mark-recapture, polar bear, population estimate, red herring, sea ice, Southern Beaufort, thick spring ice, USFWS, Vongraven, western hudson bay. Bookmark the permalink.